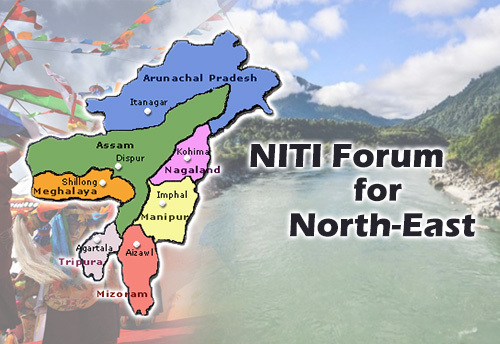 A crucial meeting of the NITI Forum for North East will be held in Agartala on Tuesday. The meeting will be chaired by the vice-chairman, NITI Aayog, Rajeev Kumar and the Minister of State (Independent Charge), Development of North Eastern Region (DoNER), Jitendra Singh. All the Chief Ministers of the north-eastern states and other dignitaries from the region will attend the meeting. Earlier on Monday, Rajiv Kumar and Jitendra Singh had addressed a joint press conference at NITI Aayog in New Delhi ahead of their departure for Agartala. A Press Information Bureau (PIB) press communiqué issued on Monday also stated that ‘emphasizing the need to identify constraints, streamline resources and add renewed focus on the north-eastern region, the NITI Aayog vice-chairman and the DONER Minister spoke about ‘moving towards a prosperous north-eastern region’. The broad agendas for the meeting include among others, strategies for ‘improving road, rail and air connectivity in the north-eastern region, realizing the hydel dream – way forward for utilizing existing potential for hydro-power in the region, agriculture and allied sectors. The meeting also envisages to encourage organic farming, cultivation of vegetables, fruits, spices, medicinal plants, soil health card for farmers for minimizing post-harvest losses, increased coverage under crop insurance, boosting milk production, water management and early completion of on-going irrigation projects and promotion of tourism etc. It may be recalled that the ‘NITI Forum for North East’ was constituted in February 2018 with an aim to ensure sustainable economic growth of the north-eastern region of the country and periodically review the development status in the region. The secretariat for the Forum has been established in the DoNER Ministry. The Forum includes representation from all north-eastern states, their Chief Secretaries and Secretaries of relevant central ministries/departments, directors of reputed institutions (IIT, IIM etc), apart from eminent experts and journalists as members.